Found in FNA Volume 8. Treatment on page 499. Plants to 7 m. Stems terete, with chambered pith. Leaf blades 2.6–9(–11.2) × 0.9–4(–5) cm, base narrowly cuneate to rounded, apex acuminate, surfaces sometimes stipitate-glandular-hairy, hairy on midvein adaxially. Flowers: calyx lobes 0.9–2 × 0.6–1.5 mm; corolla 6–9.5 × 3–5 mm, glabrous; filaments 4–5.5 mm; style impressed into ovary apex. Capsules 3–4 × 4.5–6.5 mm, placentae subapical. Seeds brown, 1.4–2 mm. 2n = 24. 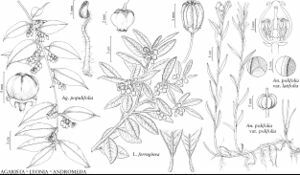 Agarista populifolia is occasionally used as an ornamental; it is the northernmost species of the genus, and is closely related to A. sleumeri Judd of Mexico. Agarista populifolia is rather variable in glandular indumentum and in the size and margins of the leaves. The plants are apparently very rare in Georgia, and the two known collections from that state lack exact localities; W. Bartram (1791) reported it growing along Saint Mary’s River.